I like these half season sets. They certainly don't tax the patience the same way that single volumes do, and taking just four months to complete a series is much more satisfying than having to wait over a year to do so. It's a win-win situation all around for customers, cheaper anime, quicker releases, less storage space required, and I'm also finding that the perceived value of a series isn't affected by how much you actually pay for it. Just because you end up paying half the normal price for a series, it in no way makes you think that it's cheap and cheerful. In fact, after watching the first half of xxxHolic last autumn, I'm of the opinion that it's one of the better quality shows out there. My preconceptions were shattered when I found it to be nothing like Tsubasa Reservoir Chronicle (with which it crosses over in manga form), and also nothing like the manga its adapted from. It's fair to say that I have been looking forward to this second half with just as much intensity as I dreaded the first. 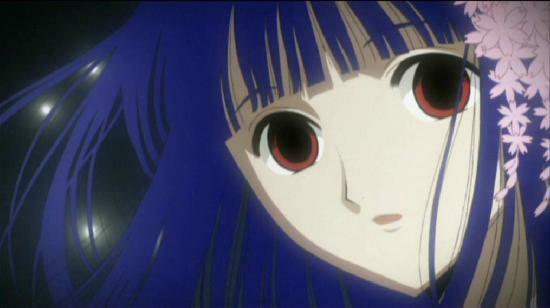 Kimishiro Watanuki would appear to be a normal young high school student, except for the fact that he can see spirits. Worse, they can see him, and are attracted to him like bees to honey. Being weighed down by spirits isn't easy on Watanuki, especially when nonplussed bystanders just see a boy behaving very oddly, so it ought to be a godsend when he finds himself at a mysterious old fashioned shop in the shadow of a skyscraper. When the owner of the shop, Yuko Ichihara offers to free him of the curse, she asks a heavy price, his soul. In this case his soul is equivalent to working off his debt part time in the shop, but Watanuki is unprepared for the strange world that he is about to enter. 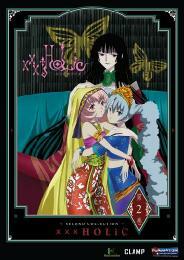 The first series of xxxHolic concludes with twelve episodes, presented by Manga Entertainment across three discs. Mei is in Watanuki's art class at school, she's a shy, introverted girl, who can often be found on the school roof, gazing wistfully as the birds fly by. But when one day Watanuki spies wings growing from her back, wings that no one else can see, Mei's personality begins to change. Following her home one day, Watanuki actually picks up a feather that she sheds, and it's enough to cause alarm when Yuko sees it. She immediately incinerates it, and warns Watanuki that he should be careful lest he becomes bait. Watanuki is confused when Yuko drags him to a department store to buy some expensive imported food. Is she dissatisfied with his cooking, or treating him to dinner for a change? Important questions like this are forgotten when they see a couple of college girls, twin sisters in the mall. 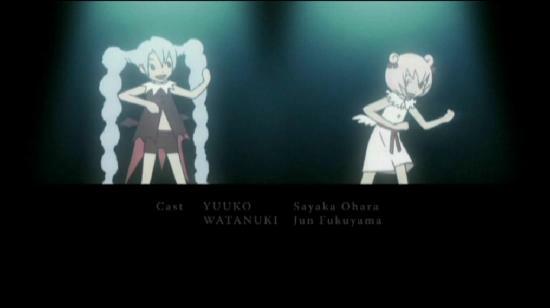 Typically, one is dominant and the other shy, but Yuko sees something odd about the pessimist older sister. Meeting her again later, Watanuki helps her look for a lost contact lens, but he can actually sense waves of negativity coming from her. Obviously they don't find it. He encounters both of the sisters again later when he's with Doumeki, and somehow they end up on a double date. The younger sister is happy to be with Doumeki, but the elder clearly doesn't want to be there in the cinema. She's desperate to leave, and it looks as if she can alter her circumstances through willpower alone. Suddenly there is blood dripping from her head. It's a shocking example of how much power words have, and Watanuki realises that the elder sister's negative prophecies are self-fulfilling. It appears the answer is simple, some positive words to break the cycle. Watanuki tries some positive reinforcement and it starts to work. The older sister breaks through her shell and starts to feel better about herself. She even works up the confidence to get a job. The problem is that she gets a job at the same place as her sister. As Yuko pointedly tells Watanuki, it's not just one person's words that have power. The Pipe Fox loves Watanuki, which is a problem now that it has adopted its larger form, and is constantly hanging around him, begging for attention. It makes doing the chores practically impossible. Watanuki finds that feeding the pipe fox fried tofu helps keep it quiet. But Yuko tells him that the junk food saps the pipe fox's spiritual energy, and that it will remain in its larger form until it gets a pure supply. Watanuki has to take it to another world brimming with spiritual energy, and that means stepping through a mystical vase. But there's also another reason why Watanuki should make the journey. Watanuki is on one of those exploitative missions for Yuko, which in this case has sent him half way across town to buy a pair of cheap fashion glasses. While there, he sees a woman waiting at a crossing. He sees something glitter on her shoulder, just before she walks into traffic. 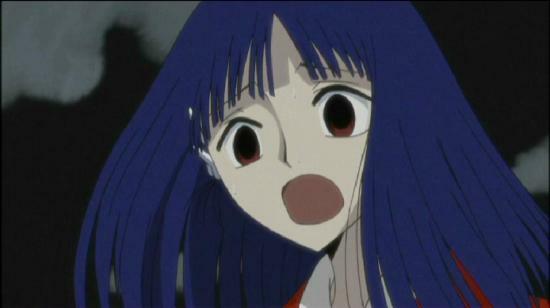 Fortunately it's just a glancing blow from a motorbike, but Watanuki accompanies her to the hospital. As she recovers, he even buys her flowers, only to have them thrown in his face by an otherwise grateful woman. It's bizarre behaviour, but then Yuko tells him of people who just can't accept their own happiness. 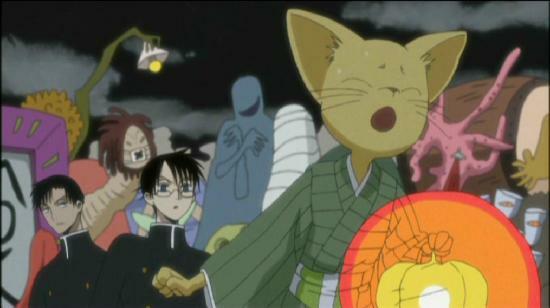 Watanuki is cleaning the warehouse again when he finds a strange picture of a cat in a kimono. He comments on it of course, only for the cat to climb out and give him a scolding. It's one of Yuko's friends, Akari, and apparently it is the season again. She gives Watanuki a Ground Cherry, a large fruit akin to a paper lantern and tells him to join the annual monster parade. He's warned not to let go of it, but he shouldn't worry, as he'll have Doumeki at his side. The snow is falling, and it's a winter wonderland outside, but not for Watanuki to appreciate, as he's still at work cleaning. He gets a breather when he finds a dusty old chest, and he tells Yuko that he'll take a look inside, and if it's worthless he'll just throw it out. Only he can't get it open. Later at school he gets a note from Yuko inviting him, Doumeki and Himawari to the park, and when they get there, they see that sisters Amewarashi and Zashikiwarashi have been invited as well. Yuko tells them that they are to have a snowball fight, and the winner will get to open the chest and have their one true wish granted. 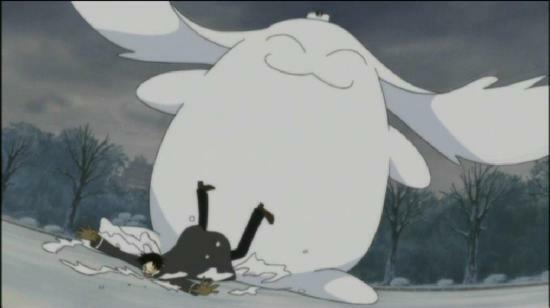 Watanuki sees a way to get out from under the yoke of Yuko, but it's an unconventional snowball fight. 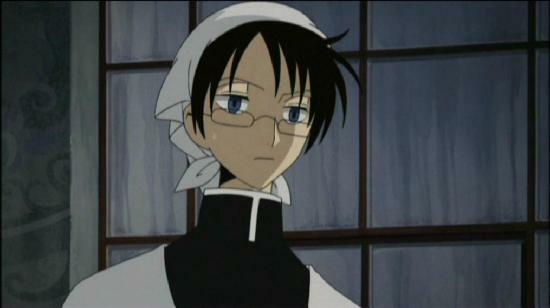 With February 14th imminent, Watanuki is on chocolate duty, and is typically grouchy about the slave work. He doesn't mind too much, as he'll get to create a culinary work of art for Himawari. The cooking is interrupted though when a woman, desperate to have a wish granted bursts into the shop. It seems a simple wish too; she just wants a photograph taken off her hands. It's in a sealed envelope though, and just looking at it sends chills down Watanuki's spine. 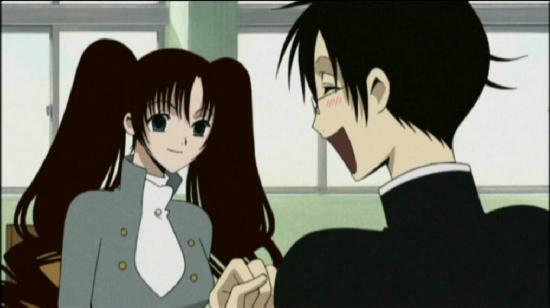 It's a wish that Watanuki thinks that Yuko shouldn't grant, but Yuko doesn't discriminate. That's the funny thing about superstitions, some of them sound absolutely stupid, but it turns out that there is a good reason behind them. Watanuki doesn't believe in superstitions, he doesn't believe that putting new shoes on at night results in ill-fortune, that lying down after eating will turn you into a cow, that cutting your nails at night will mean you miss your parents' funerals, or that a tea leaf standing upright in your tea is a good omen. He's about to learn just how wrong he is. 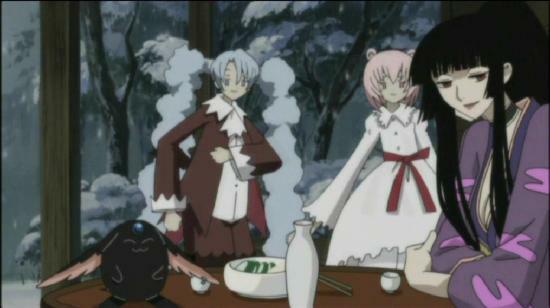 Yuko and Mokona are out of town, and Watanuki's left in the shop, cleaning as usual. He's interrupted by an elegant woman who stops to say hello, and they start to chat. Then the phone rings, and it's Yuko informing him that she will be out of town for a while, and that he should enjoy the time as a holiday from work, more importantly that he should watch his back. At school he gets another warning from Doumeki, who somewhat enigmatically warns him that he should keep the pipe fox with him at all times. Of course it's advice that Watanuki ignores on general principle, and it's hard to see why not. After all, no longer slaving at the shop means time to relax, time to pursue the delightful Himawari, and time to spend with the elegant woman from the shop. She bumps into him again, and invites him to the park to share some coffee. They get to talking and he learns that she's a grieving mother, lamenting the loss of her son. It resonates with Watanuki, who lost his own parents when he was a child, and he realises that the two of them are kindred spirits. But Watanuki has developed a cough, and it keeps getting worse. The next time that Yuko calls to rebuke him for ignoring her advice, he collapses. The shame is almost too much to bear, Watanuki has to be rescued by Doumeki of all people. Doumeki also has a few choice words for him for ignoring his advice. It's clear that Watanuki has a choice, continue seeing the woman and risk his life, or fail to keep his promise. It turns out that Doumeki has a choice too, and depending on what he does, it may mean the end of the world's most antagonistic friendship. 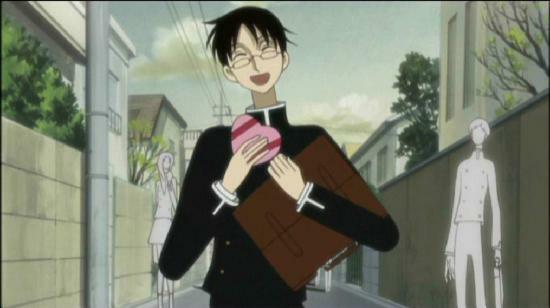 Spirits have always plagued Watanuki, and even before he started Junior High he was chased down a street by a disembodied hand that only he could see. He and one other that is. A boy in a tree rescued Watanuki, and the young orphan formed his first real friendship. It turned out that the boy knew quite a bit about spirits and the supernatural, and he helped Watanuki deal with the ghosts that often tormented him. But the boy hid a secret of his own. This is one of the better serial anime transfers I have seen of late. The 1.78:1 anamorphic transfer is clear and sharp with strong colours, free of artefacts, with just the slightest hint of NTSC-PAL conversion issues. It's worth comparing it to Revelation's Tsubasa, which has a softer and hazier feel to it. The contrast here is strong, image much better defined, and the only nitpick I'd have are a couple of colour gradient issues that you can't get away from on DVD. The look of the show is worth commenting on, especially with reference once more to Tsubasa. Both series were created in manga form by CLAMP, both feature stylised artwork, elegant character designs, and a somewhat similar feel. 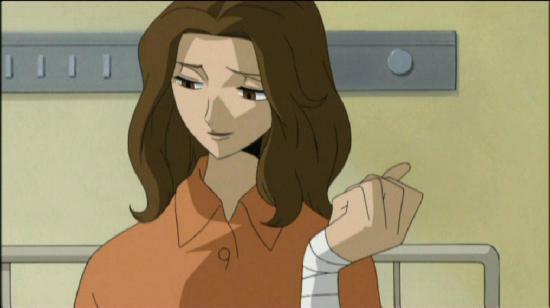 When it came to the anime adaptations, Bee Train (Madlax & Noir) handled Tsubasa, and other than the rangy character designs, theirs was a rather conventional anime that would appeal to general audiences. Production IG (Ghost In The Shell: Stand Alone Complex, Otogi Zoshi) handle the work on xxxHolic, and they've produced something a whole lot quirkier and attractive. It may also account for the cleaner and crisper look to the transfer. 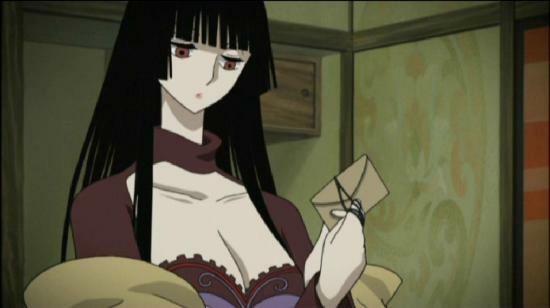 xxxHolic is very much a spooky, Gothic mystery of an animation, and that is reflected in the show's look. The characters' leanness is emphasised here to an exaggerated degree, lines are simple and elegant, and simplicity is the order of the day. This contrasts with ornate world designs, detailed graphics of everyday objects and a very lived in feel to the world. 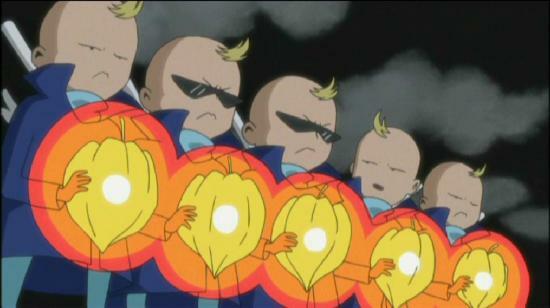 The animation is eccentric and prone to exaggeration, especially when Watanuki flies off the handle, while non-important characters, massed crowds are represented by monochrome, generic, outlined figures. There's something altogether pleasant about xxxHolic that really appeals to me. You have a choice between DD 5.1 English and DD 2.0 Japanese, and thankfully Manga have kept the original subtitle streams, so you get a translated subtitle track to accompany the Japanese audio, as well as a signs only track to go with the English dub. I was perfectly happy with the Japanese stereo, but for the first time in ages, I was less than impressed with an English dub. The 5.1 mix is an improvement on the stereo, as there is a fair bit of ambience and presence to the sound, but the direction of the dub is questionable, the majority of the voices seemed miscast, or the result of poor character decisions, and after ten minutes of listening to the English track, I simply had to switch it off. It actually sounded like a cartoon, which isn't what you want from anime. I just received the check discs, so I'm unaware of what you may receive with the packaging, but the discs themselves seem identical in content to their region 1 Funimation counterparts, albeit bundled up in a three-disc set as opposed to being released individually. So all you will find on each disc are static menus, jacket pictures, textless credits, and a brief image slideshow gallery specific to each disc. There are also trailers for further Funimation titles being released this year by Manga, Baldr Force EXE, Always My Santa, Ghost Hunt, Jyu-Oh-Sei, and Black Blood Brothers. Incidentally, the second ending sequence has instantly become one of my favourites, simply for the vision of Maru and Moro playing air guitar over the end theme. You wouldn't think that it would be possible to be totally entertained by a series, and be disappointed at the same time, but it does happen, and proportionately more so with anime than with other media. It all boils down to the perennial problem of ongoing manga. An anime series is made to a deadline, has to fit into a production schedule and offer a set number of episodes in which it tells its story. That's a problem that manga artists rarely have, taking as long as they need to tell a story as long as the issues sell. This usually means that a television series has to be done and dusted long before the manga story actually concludes, and that either means a hastily cobbled together ending by the anime producers, or simply no ending at all. xxxHolic is one of those episodic supernatural mystery series that is a wonderful anthology of stories, but it does have an overriding arc for its main characters. That isn't resolved in this series, although there is character development as the show progresses. This is the series for you if you like things spooky and eerie, with a more varied collection of ghosts and spirits, superstitions and mysteries than I would have thought the genre could support. It certainly makes the narrow range of genres usually seen in Western Horror look pathetic in comparison. xxxHolic also plays things with a dark comic edge to them, emphasising the quirky nature of its characters and the way they interact. It's almost stereotypical at times, verging more on the caricature than the character but it serves to contrast the more dramatic and emotional moments. Watanuki's short fuse and tendency to fly off the handle, especially at Doumeki is a trait that I find charming, but I can see how some people may find it grating. This half of the series reveals its first two part stories, but most are single episode affairs, offering short but rich slices of mystery to savour, and I found most of them to be enthralling pieces of entertainment. They vary between the supernatural, and odd personality quirks that people need help dealing with. We begin with a girl who's suddenly growing a pair of wings, which is definitely on the eerie side of the street, but then we're back to reality with twin sisters, one whose negativity and pessimism is palpable, while the other's optimistic outgoing nature actually holds her older sister back. Apart from the waves of negative energy being emitted by one of the girls, it could be any real world story. Most are vivid memorable pieces of story telling, but if there was a stinker among these episodes, I'd say it was Self-Mutilation, which is a little too static and talky, a case of telling rather than showing. There are character developments to take note of. It appears that Watanuki isn't as single minded in his pursuit of Himawari as earlier episodes intimated, with him at least open to the possibility of other women. Also, it turns out that he has an admirer too, with Amewarashi's sister Zashikiwarashi (the girl who stole Doumeki's soul in the first half of the series) developing a soft spot for him, and entering shy blush mode whenever he's around. It's also clear that Watanuki has some affection for her as well. There are tantalising hints to other aspects of the xxxHolic world, we learn that Moro and Maru can't leave the shop because they lack souls, while Yuko has an ominous reason why she hasn't invited Doumeki to her shop, although we don't hear what that reason is. But again these things aren't followed up before the end of the series, and that ominous warning of Yuko's, that Himawari is not the girl for Watanuki gets no resolution here either. We learn quite a lot about these characters, but at the same time, not nearly enough. Still, the series finishes on a high note, with a couple of very personal stories for Watanuki. The first sees him encountering an older woman, grieving for the loss of her son, and finding solace with Watanuki. It's no surprise that Watanuki sees her as a maternal figure, and the friendship that the two form is sweet and heartfelt. Except of course that she's more than she appears to be, and it's endangering Watanuki to be with her. As the penultimate episode says, it all boils down to choices, and Watanuki chooses to be with her, suspecting her true nature, and knowing full well that he's endangering his life. That it's Doumeki who makes the final choice of all, says more about the friendship the two have formed than any amount of yelling and screaming (Watanuki) and stoic indifference (Doumeki) will ever do. The final episode is more of a bonus really, but offers us a peek into Watanuki's childhood, and a glimpse of events that made him who he is. But in reality, this second half of xxxHolic leaves things hanging, and it's rather infuriating too, as I personally would love to see more of this series. There is more too, but it looks as if it will be a wait. In America, Funimation have the rights to the xxxHolic movie, and have released it as a double feature with the Tsubasa movie. Revelation have the rights to Tsubasa here, while Manga are releasing xxxHolic, so it will be interesting to see in what form the movies will arrive, if at all. There was also a second, shorter series released in Japan, xxxHolic: Kei, and two OVA episodes xxxHolic: Shunmuki are due later this year. At the time of writing, they haven't been licensed in the West. 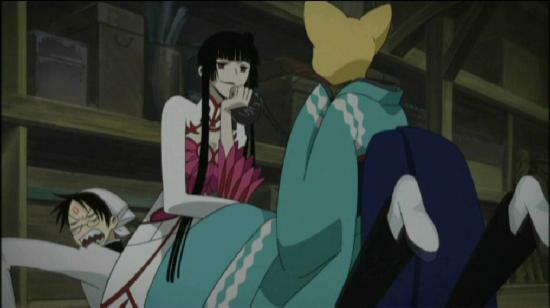 xxxHolic is great, episodic supernatural entertainment, full of quirky characters and a delicious variety of stories. If you like your anime a little twisted from the norm, and can put up with all the loose ends, then this show is highly recommended. The half season format is like a little kiss to your wallet as well.